Watch out visitors, we started the morning off with brunch with the Millers and Cooper welcomed little Avery by trying to eat her toes. In the afternoon we took a flight out to the Olympic Peninsula to check out where we will be staying over Labor Day weekend. It was super windy when we landed in Port Angeles so we opted to just fly home. 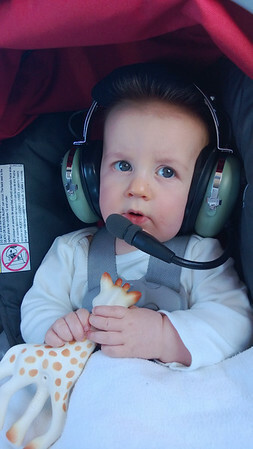 This was the first time we put a two-way headset on Cooper. He seemed to enjoy hearing our voices vs. the silence of the other headset and he even talked a little. We are still working on helping him understand that you don’t actually eat the microphone.